In the past few weeks Leighton has suddenly taken to hitting and kicking as his way of dealing with something. If Caedmon takes a toy then Leighton will bonk him on the head. If he gets tired and doesn’t want to do something then he tries to hit or kick Clint or I. Obviously this has not gone over well. I’ve tried talking with him, tried putting him in time out, tried taking toys away, tried just about everything but while it would work for a few minutes nothing lasted longer then the moment. I was kind of at a loss. My parents came for dinner last week. It’s such a blessing to live close to my parents, both because we are close to them, they have a ton of wisdom, and the boys love spending time with them. Anyway when they were over last week Leighton and Caedmon were playing and out of the blue, Leighton smacked Caedmon. She sat down with Leighton and had a talk and also offered me some suggestions for ideas to see what would work. The next day I thought of doing a sticker chart. He loves stickers and needed a little motivation. I texted Clint the idea because I was at work and Clint thought it sounded great. He told Leighton, so that night when I walked in the door he met me and then went immediately to the table and said “I’m ready to make my chart mommy”. So we set to work. He was so proud of it and we found a good central place to hang it, and hung it high enough that Caedmon couldn’t rip it down. I was amazed at how well it worked, at the end of the first day, he told me “Mommy I didn’t hit anyone today”. The next day was another good day, and at the end of the day asked me “Mommy, can we make a chart about not picking my nose or licking my snotters” (another problem recently). I told him that we’d focus on the no hitting and kicking right now since that hurts others, and when we’ve got that down we’ll work on the nose/snotters issue. A couple nights later we had a busy day and he was VERY tired by bath time. When he gets tired he kind of falls apart. He was upset by something minor and when we were grabbing PJs to put on after the bath, he swung at me like he was going to hit me. I told him sternly “I know you are tired but this is a really important time to learn how not to take your frustrations out by hitting people. If you are frustrated we need to go for a walk or take some deep breaths to calm down”. He took some deep breaths and we went on the rest of the bath/bed time routine. I had actually planned on letting him get a sticker that evening because he had done so well all day and hadn’t actually hit, had just started to motion like he was going to. We got busy with bedtime routines and forgot to do it. The next morning when he woke up, I told him that we needed to get a sticker from the day before. 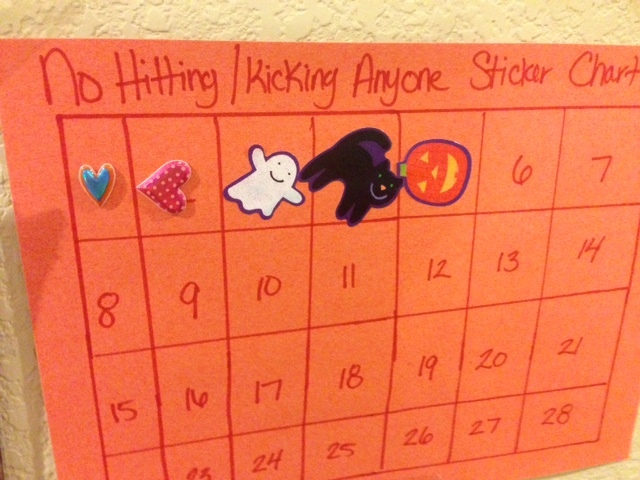 He looked at me very seriously and said “Mommy, I tried to hit once and so I don’t get a sticker”. I was so impressed and humbled by his honesty. And so we march on in the lesson of no hitting, and likely very soon the lesson of not licking our snot or picking our nose, but we’ve got the important lesson of integrity and honesty down. What else could a mom want?